On the overgrown hillside overlooking Hillsborough in Sheffield, known in the 11th century as ‘Wereldesend’, lies the now near forgotten Wardsend Cemetery. 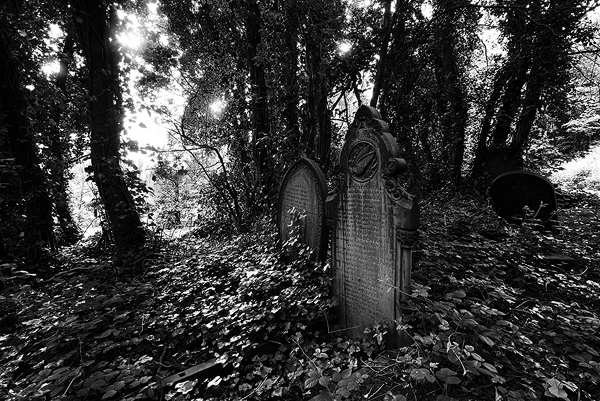 Victorian monumental headstones loom out of woodland and dense ivy undergrowth. Rusted wrought iron railings and the tombs to which they are attached, tumble back into the earth to join those that lie beneath. 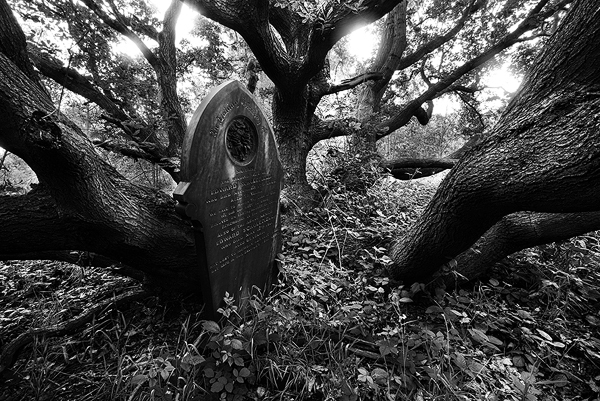 The land on which the cemetery now stands, was bought in 1857 by Rev. John Livesey when the churchyard of St. Philip’s Church on Infirmary Road (since demolished) closed for burials. It was consecrated by the Archbishop of York, Thomas Musgrave, on the 5th of July 1859. The first burial being a two year old girl, named Ann Marie Marsden. 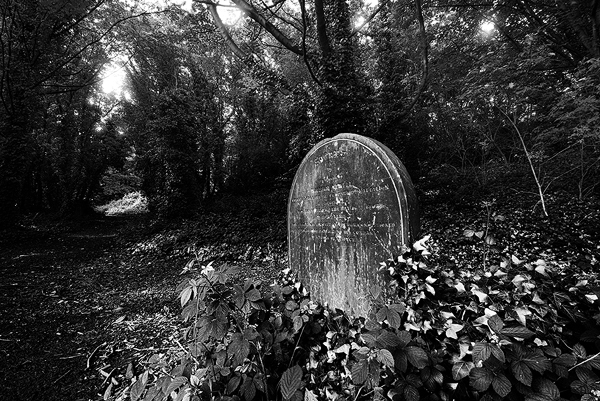 She is, in keeping with tradition, the ‘Guardian of the Cemetery.’ A small chapel and Sexton’s house were included, only the ruined footings of which remain today. The cemetery has a close association with the nearby Hillsborough Barracks and an obelisk commemorates the soldiers of 6th, 19th, 24th, 33rd, 51st, 55th Regiments of Foot, Victorian Army, who died whilst at Hillsborough Barracks during the period 1866 – 1869. There are graves of several soldiers, killed during both World Wars as well as some of the 240 victims of the Great Sheffield Flood of the night of 11th/12 March 1864, when the Dale Dyke reservoir at Bradfield collapsed. Local legend has it that of the four clock faces on the old St. Philip’s Church tower, one was never lit at night. This, it was said, was to allow the bodysnatchers at the nearby Wardsend Cemetery to carry out their grisly work, unable to see when the witching hour had come. Nefarious deeds came to light in 1862, when a labourer named Robert Dixon accused the sexton, Isaac Howard of disinterring newly buried bodies and selling them for dissection. The suspicion was that Isaac Howard was supplying the Sheffield Medical School with corpses for dissection. Also that money supplied by the medical school for the ‘decent burial’ of remains legally obtained from the workhouse, was being kept by Howard and the bodies disposed of in a less than respectful manner. As the news broke, it caused revulsion amongst the occupants of Sheffield, many of who would have had family members buried at Wardsend. On the evening of June 3rd, what became known as the Sheffield Cemetery Riots of 1862 took place when a crowd gathered at the cemetery to find a large hole containing coffins, with and without bodies, one of which had clearly been dissected. Underneath the coffins was said to be several feet of human remains. Many of the crowd began to disinter the coffins of their relatives and a number of graves were found to be empty. The crowd forced their way into the sexton’s house demolishing the windows and doors, before marching to Howard’s home half a mile away in Burrowlee. Howard learned a mob was on the way, fled and went into hiding, eventually being found in Bakewell, Derbyshire. The crowd set fire to his house, which was completely destroyed. It emerged that the law had been breached by both the medical school and the town’s workhouse. The workhouse had sent bodies to the school in sacks and the school, after dissecting them, had allowed Howard to convey them to Wardsend in plain wooden boxes. The law required that coffins should be used. It appears that the medical school, nervous of its reputation as a school for bodysnatchers, were trying to hush up its activities. Now the grim tale took a sensational twist as suspicion began to focus on the Rev. John Livesey. It was revealed that he had made a false entry in the burial register, having failed to check that the body of a boy named James Greatorex had been interred. On June 11th, a public meeting of parishioners at the Peacock Inn, Hoyle Street, severely criticised Livesey. The next night a crowd of 3,000 Sheffielders gathered in the Temperance Hall, Townhead Street, and demanded Livesey should be suspended until he had either been cleared or condemned. On June 23rd, Livesey was committed to York Assizes, charged with making a false entry in the burial register. Isaac Howard made a statement implicating Livesey. He said that he had removed bodies from their graves, but only on the instructions of the Vicar. Howard was committed to York Assizes, charged with unlawfully disinterring the bodies of two children, William Henry Johnson and Charley Hinchliffe. Although there was little evidence against Livesey, the jury found him guilty. The judge showed what he thought of the verdict and sentenced the clergyman to one week imprisonment. Howard, also found guilty, was also treated leniently and was given a three month sentence. Livesey was later pardoned, after Howard came clean about his crimes. By the turn of the century over 20,000 interments had taken place and in 1901, a further two acres of land on the other side of the railway were added. Wardsend Cemetery remains the only cemetery in England with a railway running through it! The final burial took place in 1977 and the cemetery was officially closed in 1988. Since then it has been virtually abandoned by the church and despite efforts by the council and the Friends of Wardsend Cemetery, it remains one of the few truly lost romantic spaces in South Yorkshire. 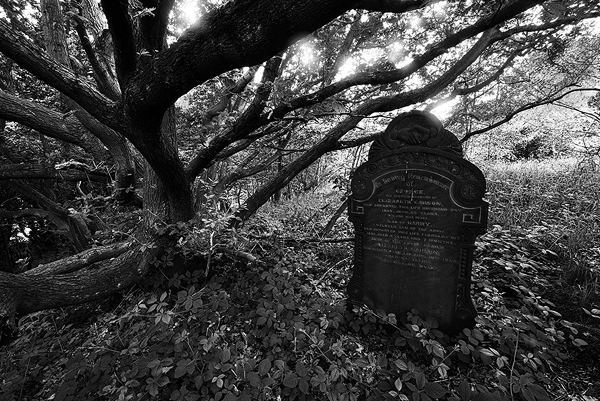 This entry was posted in History, Sheffield, Yorkshire and tagged body snatchers, grave robbers, graveyard, hillsborough, overgrown, sheffield, wardsend cemetery by andyhemingway. Bookmark the permalink.